Homage to Guru Protector Dorje Shugden! Since the Western Shugden Society demonstrated against the Dalai Lama’s ban on the practice of Wisdom Buddha Dorje Shugden last year, much has happened that is a cause for rejoicing. 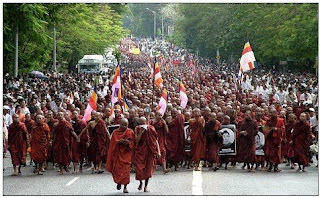 These demonstrations came about because the Tibetan government were organizing the expulsion of Dorje Shugden practitioners from Tibetan society with those practitioners having no recourse and no free speech, and although the WSS made many requests to the Dalai Lama requesting him to stop, he never replied. The peaceful protests arose out of compassion, not out of anger. Now the problems they were addressing have stopped, at least temporarily. Moreover, developments on various fronts also show how necessary and effective this expression of free speech in Western society was in terms of showing support and thereby increasing the confidence of sincere practitioners in India and elsewhere. They have heralded a revival of Dorje Shugden practice throughout the world. As the world media spotlight is never far away, the Dalai Lama and his followers are forced to be more cautious, and as a result we are hearing less about the persecution of Dorje Shugden practitioners in the Tibetan exile community in India. Recent information indicates that the Tibetan government have stopped the persecution because the Dalai Lama’s reputation is decreasing in the world due to this mistake. If the Dalai Lama continues to speak out and act to destroy the practice of Dorje Shugden and the beloved Gelugupa tradition transmitted by the lineage holders Je Phabongkhapa and Trijang Rinpoche, as well as many other great Gelugpa Lamas and their disciples, he now knows that WSS demonstrators will continue to protest to bring this hypocrisy and injustice to the world’s attention. The WSS wants peace. If the Dalai Lama and his government stop, the demonstrations stop. If they do not stop, the WSS does not stop. The Dalai Lama’s student and Tibetan prime minister, the monk Samdhong Rinpoche, has even been embarrassed into publicly criticizing the Abbots for the forced signature campaign. This is ironic, as he was of course an instigator of this campaign, but it is a clear indication that the exile government knows now that they cannot get away with this disastrous policy, and feel the political need to distance themselves from it by scapegoating the Abbots. The court case against the Dalai Lama and Samdhong Rinpoche wends its way through the Delhi High Court, to be heard in September. Whatever the outcome, it is at least being taken seriously as there are pages upon pages of documented evidence of the ban and its repercussions — persecution, violence, segregation, etc. Recently the Ganden Tripa, the Ganden Throne Holder and head of the Gelugpa school, spoke out publicly in support of Trijang Choktrul. The Dalai Lama has never been the head of the Gelugpa school (nor any of the other Tibetan Buddhist schools); it is the Ganden Tripa who has traditionally been responsible for what happens within the Tibetan Gelugpa tradition, and this support for a famous Tibetan Dorje Shugden practitioner indicates the Ganden Tripa’s lack of support for the Dalai Lama’s interference in this tradition. It indicates that more and more Gelugpa Lamas who have continued their practice of Dorje Shugden in secret now have the confidence to come out of the closet and defy the Dalai Lama and his government in exile. Many Lamas, monks and other practitioners now have the confidence to join forces in practicing this tradition openly. Perhaps the most compelling sign that the tide is turning is the growth of the monasteries Serpom Norling and Shar Gaden. Very fortunately, 500 monks from Ganden and 400 monks from Sera received their own land and are making new monasteries and temples where they can continue to practice the Gelugpa tradition purely without political disturbance. They are receiving financial support from individuals in the West, other Tibetan Lamas, and the WSS. As you can see from the pictures, they are working extremely hard and effectively, just as Dorje Shugden practitioners once upon a time worked hard to build the Tibetan community in exile after 1959. These extraordinary qualified monasteries have arisen just ten minutes away from Sera and Ganden monasteries, the homes the monks were forced to leave for refusing to sign their names to say they would not support Dorje Shugden practitioners either materially or spiritually. These impressive buildings and the daily religious activities of the monks are a potent witness to the Dalai Lama’s failure to use his power and reputation to stamp out a pure religious tradition. The lineage Gurus have been restored to their rightful places on the thrones and the walls of the new temples. These new developments also show clearly how religion and politics do not mix. It seems as though the pure Gelugpas have broken away forever from Tibetan politics, both in the West and in the East. 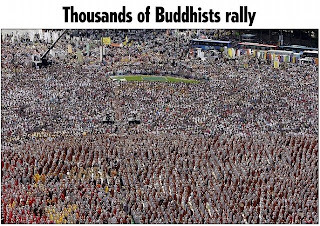 Despite some run ins with Dalai Lama supporters, the ranks of the monks are growing all the time. There seems to be a revival of Dorje Shugden practice throughout the East, with temples and monasteries growing up or continuing to flourish in Tibet, in Chatreng, Chamdo and Kham, as well as in Mongolia, Nepal, and Taiwan. In the West, the New Kadampa Tradition also flourishes, with over 1100 Centers and branches. 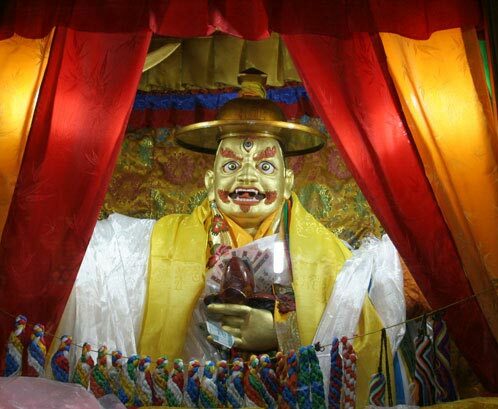 There are also Dorje Shugden statues being built both in the East and the West. People from all around the world are ordering more and more Dorje Shugden statues to be intalled in their respective centres and temples. This summer will see the unveiling of a beautiful new set of Dorje Shugden five lineages in the Kadampa Temple in England. Last but not least, next week in England between 4000 and 5000 Western Buddhists, more than ever before, will receive a Dorje Shugden empowerment and Lamrim teachings from Venerable Geshe Kelsang Gyatso at the UK Kadampa Meditation Centre. For his entire life, Geshe Kelsang has fearlessly practiced, preserved, and promoted the pure Gelugpa tradition of Je Tsongkhapa as passed to him by Trijang Rinpoche. All in all, it is proving impossible to stamp out this great tradition. Dorje Shugden’s time has come! May all living beings be happy and experience religious freedom. And may all favorable conditions abound. If you know of other hopeful developments, please let us know in the comments section. The recent protests in Philadelphia attracted a lot of media attention. Including a photo and cutline on page 3A of USA Today.